Why “Three-Cup”? It refers to one cup of sesame oil, one cup of soy sauce and one cup of rice wine. Of course, this amount is for cooking a lot of chicken. When you are cooking for less chicken, be sure to scale down these three ingredients to 1:1:1. Oh, and basil leaves is a MUST– the basil fragrance really enhances this dish. Three-Cup Chicken 三杯鷄… Yum! The sauce is so finger licking good that you’ll want to refill your rice bowl. Wash mid joints and remove any tiny pieces of broken bones. Season with salt for 30 minutes. Heat a wok on high heat and pour in sesame oil. When the wok gets smoky, add in chicken pieces. Sauté on high heat until the chicken turns lightly brown and the meat is almost cooked. Add in ginger, garlic and pepper. Sauté until the aroma comes out. Stir in rice wine and soy sauce. Turn down the heat a little, and stir until the meat is cooked through and sauce thicken slightly (if your meat is more on the raw side, you can also cover with a lid at this step so the meat cooks faster). Add in basil leaves. Stir a few times until basil leaves soften. Dish out. Serve hot immediately with steamed rice. 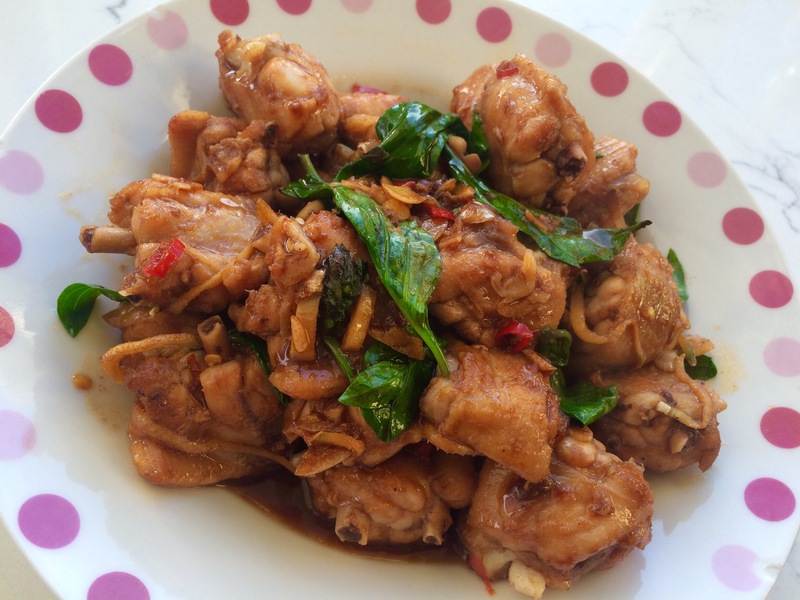 Chicken Mid Joints: I am not good at making big chop with my cleaver knife– the bones always never have a clean cut and the meat pieces are sometimes crumbly… and not to mention the raw meat juice splashing everywhere on my kitchen counter. So, my solution is chopping the wing mid joint when they half frozen, without washing– the process is much easier to manage and way less splashing. Wash the meat and remove any tiny broken bone pieces after chopping. Alternatively you can use boneless chicken thigh pieces, but I prefer bone-in for better flavor. Sesame Oil: Typically the amount of sesame oil is same as rice wine and soy sauce, but I cut down to 2 tbsp (you can even use 1 tbsp) and use chicken fat rendered from high heat sautéing. Thai basil leaves: After adding basil leaves to cooking, cook briefly until the leaves soften then dish out so the fragrance of the leaves stay with the meat. Chocolate Belgian Waffle~~ maple syrup, whipping cream and berries topping really bring out the rich chocolaty flavor of the waffle. Sift flour, cocoa powder, baking powder and salt into a big mixing bowl. In a small bowl, whisk egg yolks, milk, cooking oil and vanilla extract to blend well. Pour yolk mixture to flour mixture all at once. Use a hand whisk to mix until batter is smooth. Whip egg whites and sugar until the peak forms. Fold in whipped egg whites into the batter in 2 batches. Take care not to over mix the batter, otherwise the waffles will be dense. Cook on waffle iron as directed in the instructions. Extras can be frozen for quick breakfast. Waffle batter can be prepared the night before and refrigerated. Let batter sit in room temperature for 1 hour before cooking. Because unsweetened cocoa powder is used so I increase amount of sugar to 2 tbsp. 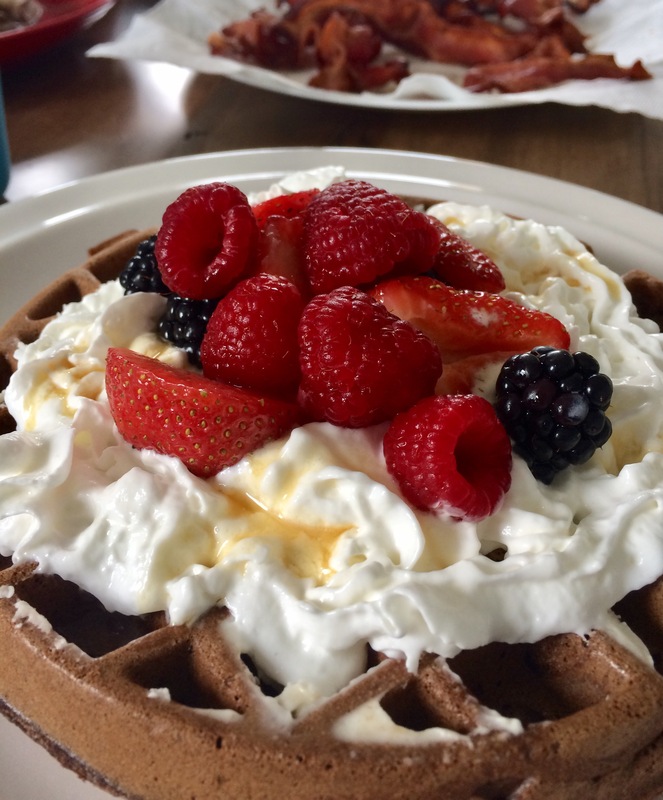 If you eat the waffle plain you might taste a little bitterness from cocoa powder, but the waffles taste perfect with maple syrup, whipping cream and berries. Choosing a good waffle iron is very important for making good fluffy waffles. 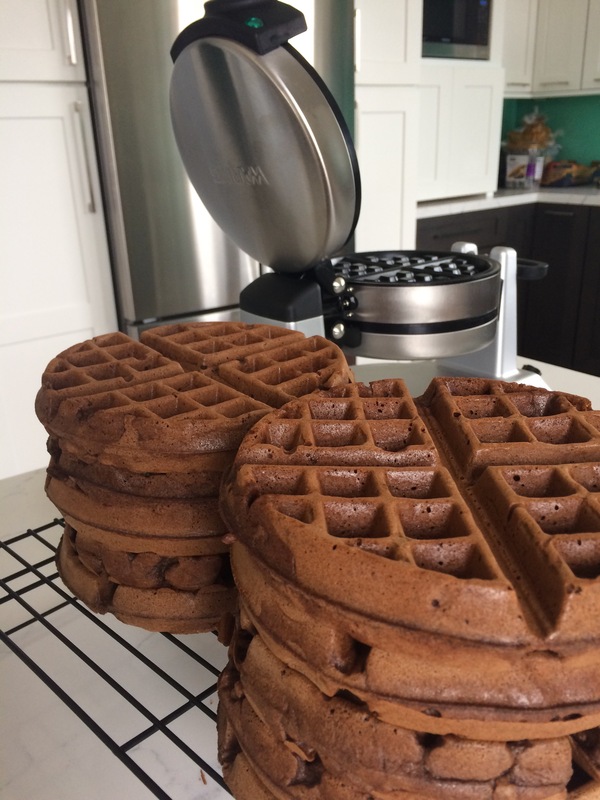 I recently upgraded to Waring WMK600 Double Belgian Waffle Maker (at a unbeatable price!) and I LOVE it! It is FAST, and makes FLUFFY waffles! Trim off any excess fat of the meat, and cut into 1-2 inch chunks. Heat up a frying pan on medium high heat, add 1/2 tbsp cooking oil. When the frying pan starts to get smoky, add in some beef chunks (do not crowd the pan with too much meat, or it will not brown nicely), and sprinkle a (more less) thin layer of meat seasoning on top of meat. Flip the meat when the bottom is browned, and repeat witha thin layer of seasoning. Transfer cooked meat to a large stock pot. Repeat this meat searing process in several batches. Turn off heat and add 4 cups to the frying pan, use a spatula/ wooden spoon to scrap off any seasoning stucked to the pan. Add this water to the meat, and fill the pot with extra water to almost cover the meat. Turn on high heat to bring the pot to a boil, then lower heat to medium low, covered and simmer for 1 hour (you prepare Chili Colorado sauce during simmering if the sauce is not ready). Stir in Chili Colorado sauce to mix well. Covered, continue to cook on medium low heat for additional 1.5-2 hours. Stir occasionally. The meat will get more tender the longer it cooks, and the sauce will slightly thicken. Turn up the heat a little towards end of cooking time if the sauce is too watery (aka too much liquid), but be sure to stir often to prevent burn at the bottom. Add salt to taste. Serve hot with Spanish rice, beans, salad and warm tortillas. Meat choice: I prefer boneless beef short rib chuck. It’s a more expensive cut of meat, but the marbled fat makes the meat very tender and moist after cooking. Chuck roast is cheaper, but I find the meat is tender but on the dry side. I always think Chili Colorado can be beef or pork version, but I have been wrong all these time~ Chili Colorado is for beef ONLY. 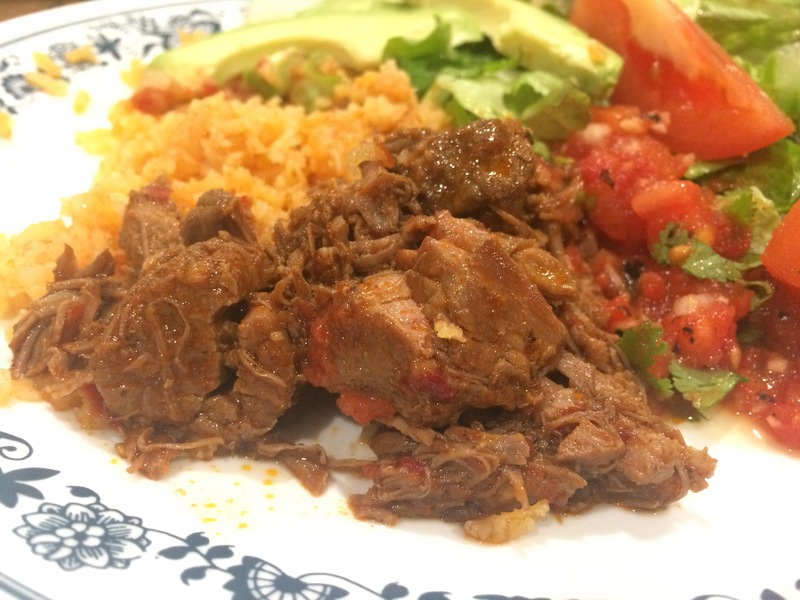 The pork version is called Carne Adovado. Remove the stems of dry pasillo chilis and guajillo chilis. Cut into pieces and add in 3 1/2 cup water. Microwave for 2 minutes. Let chilis soak in water while you prepare other ingredients. Remove stems of red bell pepper and jalapeño/Serrano pepper. Cut into chunks. Cut onion into chunks too. Add softened chilis, red bell peppers, jalapeño/Serrano peppers, onion, and soaking water to a blender. Blend until smooth. Heat up a saucepan on medium high heat, add 1 tbsp cooking, blender mixture and seasonings. Stir constantly for 5 minutes (beware that the sauce at this liquid-ty stage will splash, by stirring constantly you can reduce splashing). Reduce heat to medium to medium low, continue stirring and cooking, until the liquid evaporates and sauce thickens to about 4 cups. The sauce is ready for use. Extra sauce can be frozen after cooling completely. Red bell pepper: original recipe uses green bell, but I prefer red bell because it brings out more of the beautiful reddish color of Chili Colorado sauce.